To John & Steve at Walker Crash Repairs, a huge thank you for all your work repairing our motorhome recently, after a slight mishap at the beginning of our planned trip to WA. Your standards are exceptional, from explaining the repairs, arranging immediate quotes, liaising with the insurance company, giving us a clear time line, and then the high quality of the completed repair work. Updates, via SMS messages & photos, were greatly appreciated. On completion, we were more than happy with the excellent work. It was your genuine care & support that enabled us to continue on with our travels. Thanks again. John and the team were absolutely fantastic with our caravan repair, fixing our van for us while we were in Adelaide. John went to all lengths to ensure that we would have our van back quickly so that we could continue on home to Sydney. John communicated with us constantly, updating us with the progress. We could not be happier with the level of professionalism and fabulous work done. Had a small altercation with a post involving my caravan. I was really worried where to go to get it fixed. I found John Walker of Walker Crash. From woe to go literally fantastic old fashioned, frank and reliable customer service. Couldn’t be happier with the result. Well done crew. John & the team have excelled with the repair of my caravan & did what they could over the difficult Christmas period too. I found Walkers to be friendly, generally helpful, the communication was excellent including updates as to progress & photos too which weren’t expected. Overall the repairs seem good & I would have no problems recommending or using again. Wow what a professional team at Walker Crash Caravan Repairs. Right from the beginning John kept us informed by phone and photos. Our caravan was damaged in Alice Springs after ringing the insurance company who recommended Walkers we towed the van to Adelaide. John was very informative about the repairs from beginning to end. Once again thank you John and your great team. We recently had our pop top caravan repaired by Walker Crash Repairs and were extremely impressed from beginning to end with the service we received. John was very prompt in returning our calls and the standard of work was excellent. We are novice caravaners and John gave us much information relating to our van and vehicle to tow it, while providing photos at different stages of the work. When we towed the van to the workshop John observed that the trailer coupling was not working correctly and we agreed to having a new one fitted. On returning to pick up the van, John informed us that one of his people, Zane, identified the problem and carried out a simple repair at no cost. This was the “icing on the cake” because there are many organisations who would have taken advantage of the situation and sold the replacement product without hesitation. With such an outstanding experience, we have no hesitation in strongly recommending John and his team at Walker Crash Repairs. A big thankyou to John who was such a great support to us after we had an accident in our caravan , our van was a write off and it was our home so we were so upset he told us where to go to look for another van and even organised for us to be able to transfer all our gear to new van while waiting for insurance to get organised . He kept in contact with us through out the whole ordeal . We would have no hesitation in recommending his business to everyone we meet on our trip around Australia . Thanks again John appreciate everything you did for us. We would like to thank John and the team for the great service and job done to fix our van, very impressed with the quality of the work and the time it took to fix, Prompt and efficient and communication was excellent. thank you. Recently our Caravan was repaired by John and his team. From our first phone conversation right through to final repair communication and service was excellent. Highly recommend this local business for caravan repairs - keep up the good work! Thanks to John and his team our little Jayco caravan is as good as new. Quick and friendly service they took the stress out of having repairs done. I would recommend them to anyone. As soon as the insurance company authorized the claim....the job was done. Damaged rear of our van in the Pilbara in September 2017. On returning home to Adelaide we contacted CIL Insurance and were referred to Walker Crash Repairs. I did not know of this company before the referral. John arranged for me to deliver the van to him the day the claim was lodged. Repairs were quoted and authorised within days. John kept me in the loop by phone for each step of the process. The little extras done by the team at Walkers made my van look better then predamage condition. I am a retired insurance broker of 40 years having dealt with the crash industry most of my working life, the customer focus and friendly professional service at Walkers exceeds industry standards. Many thanks to John and his team for their commitment in repairing the damage to our caravan. After a run-in with a kangaroo while on holiday, John was able to come out to our house the next day to assess the damage and to draw up a quote for our Insurers. We had difficulty with our van manufacturer supplying replacement parts and after countless attempts to source what was required, John and his team had to fabricate all the parts themselves. They showed excellent customer service throughout the whole process and second-to-none commitment with completing the repairs to a very high standard of work. I would 100% recommend Walker Crash for your caravan repairs. Thank you John and the rest of Your team for doing a fantastic repair on our caravan, You made everything so simple and straightforward. Thanks also for all the free advise!!! We would not hesitate to recommend you and would use your business again should the need arise. I have just had the pleasure of dealing with John Walker and the team, We were very impressed with the work they carried out, every step of the way they kept us informed and sent photos. The out come was truly amazing, I basically have a brand new caravan. 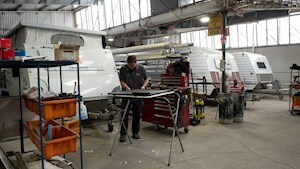 We would not take our caravan any where else to be repaired. We will be recommending John to all the grey nomads who need work done on their caravans. Thank you John and team. Excellent effort. In July, 2017, we sheered our A frame off the front of our caravan on the Oodnadatta track. Our caravan was transported to Adelaide to Walkers smash and caravan repairs to be assessed by our insurer. We found John to be extremely helpful when dealing with the insurance assessor and he kept us informed daily all the way through the repair by phone and photos. John and his team did an excellent job in record time to get us back on the road as we came from Queensland. We are extremely happy with the repair work and would highly recommend John and his team for any repairs. The repair work and service I received from the team at Walker Crash for my caravan was excellent. 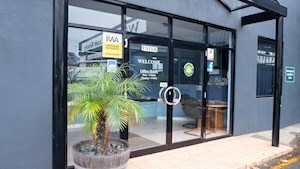 It is easy to see why Walker Crash Repairs of Prospect is on Insurance Company APIA’s short list as a repairer of accident damaged caravans in Adelaide. In response to my phone call, John actually came to our house, precisely at the agreed time to view the damage and prepare his quotation to APIA for the repair. Not only was he un-phased that this was a European caravan, and therefore some-what different to Australian built vans but he was very easy to talk to and promised a quick response. APIA then came to the party and authorised the repairs in just three days from John’s visit to my house. Within a week the caravan was at John’s premises in Churchill Road, Prospect and repaired and ready for pickup after repair on the next business day exactly as promised. We now have a brand new Dometic awning on our caravan (they replaced the roller and all, not just the torn fabric) and Steve has professionally removed the scratches inflicted on the Heiki roof hatch by flapping awning fabric. Removal of the scratches had been predicted by others to be an impossible task! I have no hesitation in recommending Walker Crash repairs for no hassle top quality repairs to your accident damaged caravan. First class service on repairing my camper trailer. John kept me in touch throughout the entire process, resolved a number of design problems, excellent workmanship and even dropped the van home for me when complete. I would highly recommend the Walker Crash team. I would like to thank John and his team for the professional work on our caravan. John went out of his way to fit our job in as we were on a timeline to go overseas. Work commenced the same day as RAA assessed the van and we were sent messages and photos at the end of every day to show progress. In this day and age when a lot of company\'s give you the run around and don’t seem to care, it was very refreshing to deal with true professionals’. Thanks again for a first class job. I will certainly recommend you to all my fellow travelers. 11 out of 10. Great job on our Roma van. From start to finish, totally professional. John made it easy for us. Very happy. Also we got our van back well ahead of time. Exceptional. Excellent service. Good work on my caravan , I am really satisfied with the finish of their work. Thanks to John and his team. I had the misfortune to discover a small stump beside a gum tree as I turned into a layover in a small country town with our 2 month old caravan. 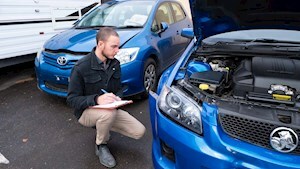 Our insurance company recommended Walker Crash Repair in Prospect SA. We had a brilliant experience from the word 'go'. John even called into the caravan park we had booked into (he was near by) and after looking at the damage, described the repair and how long it would take. True to his word, from the day we dropped it off till the day we picked it up, every thing he had said occurred. Progress photos, consultation and competed on time. There is absolutely no sign the caravan had been damaged at all following the repair. What was just as impressive was the follow up to ensure everything was working as it should. A man (and company) of his (their) word. John and his team repaired hail damage to my caravan. Great people to deal with. Kept me informed about what was happening and what my options were. Everything that they promised was delivered. Great company to deal with and great repair job. Thanks to John & staff for the prompt and excellent service on the repair of our hail damaged caravan. Having lived in country SA all my working life i found myself needing repairs to my caravan within my first six months of retirement in Adelaide. Right from my first contact with John Walker and his team to discuss repairs to my caravan I felt absolutely comfortable that I had come to the right place. John took the time to explain the whole process and what would be the outcomes. John helped me through the claim process and we were sent photos of the repair work as it progressed. I also have decided to take my two vehicles to WCR following hail damage. Fantastic friendly staff and no questions were treated as silly I will recommend them to my friends anytime.
" I also pointed out a design flaw in my caravan around the bed base. John and his team came up with a solution for it at no cost which was sensational. Thank you very much John." New awning was installed on my caravan, very pleased with service and very friendly staff. On November 11th my van was damaged by hail. Walker Crash was recommended to me by a local crash repairer. I would like to thank John and his team for the professional work and the day to day up date of repair with photos attachéd of work in progress. Back on the road 23/12/16. Thank you John and team. Five stars John. Attention to detail, customer service and importantly, a genuine interest in our problem. John kept us up to date regularly, sending photos etc. The end result is better than it was when new. Thank you John. We'll pass your name on to anyone who asks. We have just picked our van up from Walker Crash Repairs after our van was damaged in an accident, and we could not have hoped for a better repair experience. Johns hands on approach, attention to detail and his obvious pride in his own and his companys ability to acheive any outcome, gave us a great deal of confidence that we had the right man for the job. He kept us regularly updated on progress and on several occassions we were invited to the workshop to see the progress for ourselves. Thankyou very much John and your team. On a recent trip to the NT we endured undue tyre wear (scrubbing) to front LHS tyre of our dual axle van. Upon our return we had problem diagnosed at Walker Crash Caravan Repairs. A bent front axle was identified. 3 options with estimated pricing to solve the issue, were offered & we opted to replace both axles & bearings with heavier duty sets. We found John Walker & his staff very friendly, capable and professional throughout the repairs. Job completed on time, within budget. Very satisfied. On Tuesday 26th April, 2016 my caravan was involved in an accident 88 kms north of Coober Pedy. Contacted my insurance company and John of Walker Crash Repairs in Adelaide rang. John immediately made me feel at ease and explain how my caravan was to be transported to Adelaide. Once the caravan arrived at Adelaide and assessed, John contacted me to fully explain the procedure to repair the caravan. As the repair was being done I received MMS and SMS updates. When we collected our caravan we were very surprised at the excellent high quality repair. I would like to thank John for his compassion, courteous, and his team for their extremely high quality workmanship. 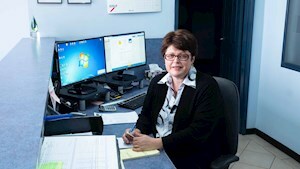 I would have no hesitation in recommending any person in having their repairs done at Walker Crash Repairs. Once again l would like to thank John and his team. Walker Crash Repairs were suggested to us as a repairer for our caravan. I have to say I can not praise them enough,they repaired the full side of our van in a prompt and professional manner whilst keeping us informed the whole time. Very happy, highly recommended. Whilst driving north of Glendamro in South Australia our A frame broke on our caravan a tow truck came from Coober Pedy to pick up the caravan. It was sent to Walker Crash Repairs in Adelaide for repair. They did a great job, kept us informed as it was fixed, it was really helpful and good workmanship. John and his team went above and beyond to fix our caravan that needed major repairs, John kept us up to date with the repairs ay every step. Great service excellent work of the highest standed, as it was our home at the time they did the work in record time. I could not recommend nor thank Walker Crash Repairs highly enough. After an accident in Port Augusta we limped into Adelaide looking to have our van repaired. John and his staff went above and beyond in getting our van back on the road. Constantly phoning,emailing and sending through photos of our van letting us know the current state of play. We would highly recommend WCR to all other caravaners who have had an unfortunate mishap to contact WCR at Prospect. Once again John thank you and your staff for the excellent service and care. Walker Crash Repairs (WCR) was one in a list of about 30 caravan and motorhome repairers provided me by CIL. Online checking supported my assumption that WCR was one of a few repairers sufficiently proficient in both mechanical and structural repairs to motorhomes. The claim was submitted by WCR to CIL within 24 hours, facilitating approval by CIL within 48 hours. Repair would have been within a working week but for delay caused by the supply of a part sourced from overseas. Not only did WCR keep me informed during the entire process but also transported me to and from my location to their premises! All staff were friendly, helpful and cooperative. I have no reservations in highly recommending John Walker and his staff to everyone. Thanks for the prompt repairs to our car and caravan and the professional workmanship.Our car was fixed quickly and John kept us informed on progress on the caravan.We would recommend Walker Crash. The guys at Walker Crash were in touch on a regular basis throughout the entire process. Their workmanship was incredible along with their attention to detail. To be able to help in the manner in which they did and not hesitate to do so at any time also was a credit to their professionalism. Thank you very much to everyone involved with my Best of Breed Freelander 2 as it has now won it's Best of Breed 1st placing for the third time in a row at the South Australian Land Rover Show 2016, Melrose on the Easter long weekend. So thank you all for the excellent work carried out and the extra things you did to ensure my Land Rover was back to normal. Thankyou!! I have had my car repaired twice in the last 2 years and can't recommend Walkers enough to friends and family. They are very professional and did the repair in a timely manner. Thanks to Chad and the crew for a great job. I wish to thank John and his staff for the very efficient and professional way they handled the repair of my caravan. They all had a very caring attitude. Nothing was too much trouble, and John went out of his way to solving a few extra problems I had with the van, such as the electric brakes and towing hitch. He also arranged a mechanic who could service my vehicle. He kept in touch and forwarded photos of the caravan when finished. I was without the van for only 3 days, it was repaired in record time and I was on my way again. As I was visiting the State and also live in my van, there was very little inconvenience due to the speed in which he managed to organise the Insurers and repair the van. Walker Crash Repair were also able to raise my van by 4 inches while they had it in the workshop. This was something I had intended to do in near future. I believe I have come away with a better and improved caravan. Thanks very much to John and his staff and I have no hesitation in referring others to Walker Crash Repair. Why don't you build caravans, it would make our lives much easier. Thank you for the service. You have given the industry a better name. My recomendations and along with CIL. MY HEART FELT THANKS. From the moment I dropped off my caravan to Walker Crash, to the time I picked it up, the service that I received was second to none. When the van was dropped off I was informed as to what was required, the time frame for repairs and how I would be kept up to date. On a regular basis I received updates, photos and txts that kept me in the loop as to what was going on, and when I called to ask a favour, it was no trouble at all. At the time of collection the handover was prompt and professional and I was on my way with my vehicle and 100% happy. I have no hesitation in recommending Walker Crash to friends and colleagues. I was stranded in Port Pirie when the A frame on my 18’ Windsor caravan broke. My insurance company were tremendous in their understanding and how quickly they actioned the claim. It was picked up the next morning and taken to Walker Crash in Adelaide. Repairs were commenced, and I picked it up with a new A frame fitted, 6 days later. I am very happy with the customer service and very impressed with the welding job done. I recently had repair work done and found all staff to be helpful, professional and made the whole experience very easy. The work was of a very high standard. Even a cleaned car!. Please pass on my sincere thanks to Chad and the staff. I would have no hesitation in recommending walker crash repairs to others. I am now into my third decade of working with Walker Crash Repairs as a consulting engineer. In that time their workshop, equipment and management practices have developed at the cutting edge of vehicle design and industry best practices. Technology has generated capability in repair, redesign and problem solving at a level that could not have been imagined in 1990 and Walker Crash Repairs are at the crest of that wave. The suspension on my supposedly off road caravan collapsed in August 2014 in Coober Pedy. John Walker was recommended to me and I was immediately impressed from my first call to John. While I chatted he was on the suspension manufacturers web site viewing the suspension details. On arrival in Adelaide John climbed into overalls and had me under the van showing what was wrong and recommending that a complete new heavy duty suspension was required to avoid the same problem occurring. The van has just completed a 15,000km return trip to Sydney via the Tanami Road and the Gibb River Rd without any problems whatsoever. John also organised for my malfunctioning air con unit to be repaired. Finally, my Sydney based caravan service/ repair centre inspected John\'s work and gave it the thumbs up. I'm very happy to recommend Walker Crash to any caravan or RV owner. When two of our Kimberley Kamper off road trailers received damage to their slide out kitchens and body work within a matter of days we were left with an urgent need for repairs to ensure we met the needs of our hirers. This was not your ‘run of the mill’ crash repairs as new kitchens needed to be ordered from Kimberly Kampers and fitted appropriately. We approached several crash repairers who were unwilling or unable to take on the work and eventually came to Walker Crash Repairs. Not only did Walker’s complete the work to a high standard, they liaised with our insurance company throughout the process, kept us informed at all stages and finished the work as quickly as possible to ensure minimal loss of business for us. Were we unfortunate enough to need crash repair services again, we would definitely return to Walker’s and would happily recommend them to others. Thank you so much to your team for their great service. As well as the quoted repairs that were carried out...i wish to thank you for the complimentary ‘extras’ that i requested, that were completed for me without fuss. Plus the great job of washing the car and blackening tyres upon completion. It was much appreciated, and its the little extras, that make a customer happy, and makes them come back....and is so necessary for small business in this current climate. I had the misfortune of having an accident towing my new caravan (it was only 2 weeks old) . The insurance wanted it fixed and recommended Walkers Crash for the repairs. don't be fooled thinking he only repairs cars. I can't say enough and thoroughly recommend Walkers Crash. You deal with the owner and are sent updates on the fix as it progresses. Johns knowledge on caravans and repairs makes the rebuild straight forward and his suggestions are welcome . He always thinks out of the square and the finished product is better and stronger than the original.On handover I was impressed with the detail he went thru on the repair and you can leave with confidence that the job was done professionally and perfectly. I recommend Walkers Crash and will be back if the need arises (hopefully not). Thanks for a great job. We had problems with a caravan wheel bearing near Nullarbor Roadhouse which resulted in the caravan being towed to Walker Crash Repairs in Adelaide for repair. We were very impressed with the service we received including the level of communication by John Walker to keep us in the loop while our van was being repaired. The repair job was excellent and John even met us on a Saturday to hand over the caravan and ensure that all was well once we hooked it up to our car. We can highly recommend Walker Crash Repairs for any repair work needed to your caravan. In June 2013 my Conqueror UEV 490 was damaged in near lake Eyre. The van was taken to Walkers Crash repairs. I stopped in three weeks later on the return trip from Alice Springs and was shown over the Van by the staff and they explained what was going to happen. When the repairs where finished John came in on a long weekend to deliver the van back to us. The repairs where perfect and the service was great. I would recommend Walkers Crash Repairs to anyone needing Caravan Repairs. My wife and I were driving with our caravan about 2 hours north of Cooper Pedy when the A frame broke. The caravan was transported to Cooper Pedy but they could not fix the problem so the caravan was transported to Adelaide to Walker Crash Repairs. Once the caravan reached Adelaide John immediately contacted the assessor for our caravan insurance and the process of fixing the A frame began the next day. The process was very professional and we were kept in the picture of what was required and John organised through the insurance company immediate repair. There was no stress for us, John and his team did all the negotiating and the process went extremely smoothly. The most important result of this experience was John fitted a much stronger A frame and the caravan drove out of John's yard a better caravan. We are extremely grateful for all that John and his team did to get us back on the road, the experience working with Walker Crash Repairs was a very positive experience. Having run a fleet of taxis and private cars, professionalism is foremost in our minds; therefore we seek out businesses we can communicate with and trust. 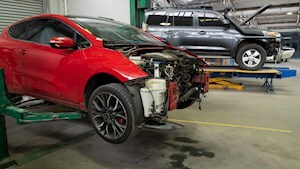 Our business has been very happy with the work performed and the cooperation of staff at Walker Crash Repairs for over 20 years and we will continue to use there services when the unfortunate occurs. We confidently refer our associates, family and friends to Walker Crash Repairs, knowing they will be provided the same good quality service. Life is about compromise, but some things should not be compromised. Quality work for safety reasons should always come first. Thank you John and the team at Walker Crash Repairs. At Seed Distributors we have a very diverse fleet, we have dealt exclusively with Walker Crash for over 15 years principally due to their high standards of workmanship and eye to detail and customer service. Seed Distributors has very high internal standards for presentation, timeliness and integrity, Walkers also reflect those standards in how they have dealt with us over a long period of time, vehicles are always repaired on time, in quote, to high standards and any follow up’s are always done promptly. All Walker’s staff explain the work done are courteous to all our own staff and always fit in with our own staff’s schedules in doing repairs. I highly recommend all fleet managers to seriously consider Walkers and I am sure they will find the same high level of workmanship, timeliness, in quote work and service we have experienced over many years and continue to do so. 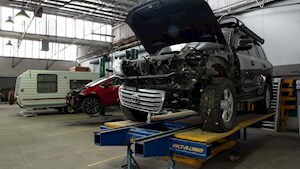 Walker Crash Repairs in Adelaide provides many additional services such as wheel repairs, paintless dent removal, plastic repairs and headlamp rejuvenation.